Rajasthan High Court Notification is out. Rajasthan High Court is recruiting for 48 District Judge Post Posts. You can check Rajasthan High Court - Rajasthan High Court last date, download Rajasthan High Court notification, visit Rajasthan High Court official website and check other Rajasthan High Court Vacancy details.Complete Vacancy and recruitment Details about 48 District Judge Post vacancies in Rajasthan High Court are provided below by JobSarkari.Com only for you. Last Date for Apply Online 10/10/2018. SC / ST / PH Rs.250/-. District Judge Cadre Candidate Must Have Passed Bachelor Degree in Law and Practicing as a Lawyer for Not Less than 07 Years With Knowledge of Hindi / Devnagri / Rajasthani Dialects and Social Custom of Rajasthan. 35 to 45 Years(05 Years Relaxation for SC / ST). 48. Q. What is the Last Date For Rajasthan High Court District Judge Post Vacancy ? A. 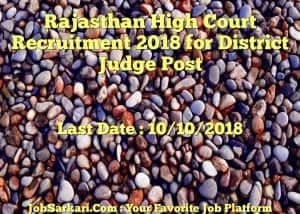 Last Date for Rajasthan High Court District Judge Post Posts is 10/10/2018. Q. 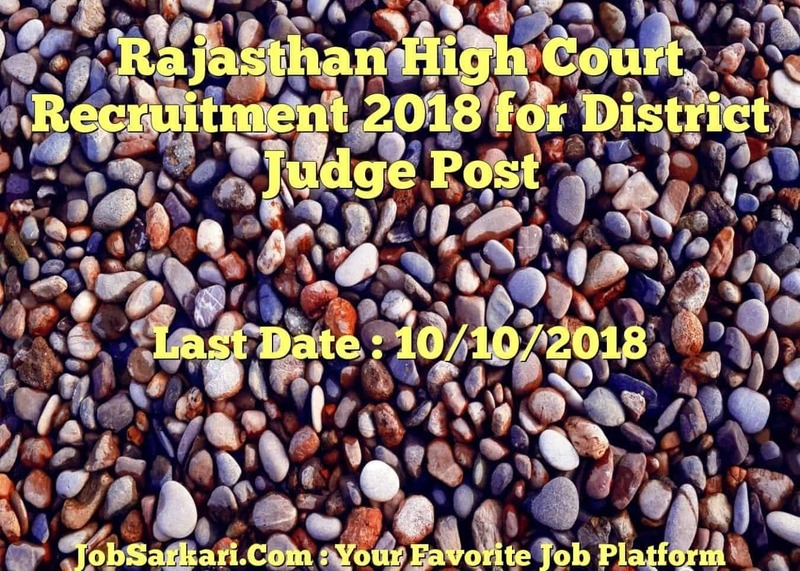 What is the Form Type of Rajasthan High Court District Judge Post Recruitment ? A. The Form Type for Rajasthan High Court District Judge Post Posts is Offline, Online. Q. How many vacancies are available in Rajasthan High Court District Judge Post Posts ? A. There are about 50 Vacancies in Rajasthan High Court District Judge Post Posts.